This last week saw Montenegro’s LGBT community hold its first official Pride event despite a crowd of several hundred protesters chanting “Kill the Gays” and threatening violence. 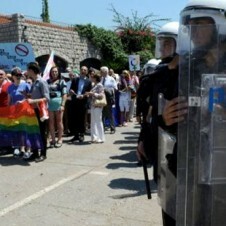 It is estimated that around 200 demonstrators hurled various implements including bottles, stones and even torches as police in the coastal town of Budva attempted to protect the 40 or so rainbow-clad marchers. Police were able to hold the anti-gay protesters back long enough for some gay rights demonstrators to make a few quick speeches but, reports say, the marchers were later forced to flee the area by boat as police held back the anti-gay crowd. Posted July 29th, 2013 & filed under Activism.